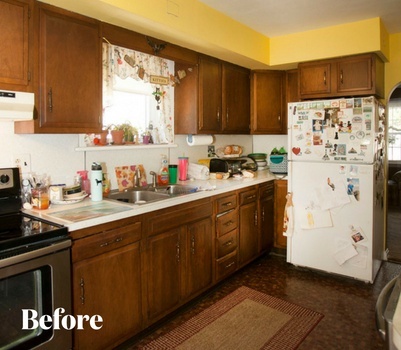 Hover your cursor over the before image to see the stunning kitchen transformation happen right before your eyes! 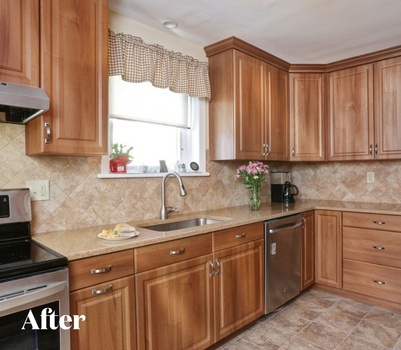 A blend of cabinet refacing and new cabinetry completely update the style of this kitchen. 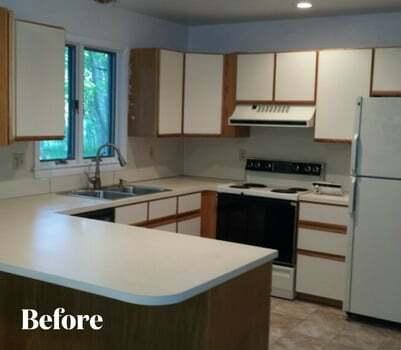 Quartz Countertops, Cambria's Bellingham, with ceramic tile backsplash finish the look off perfectly. 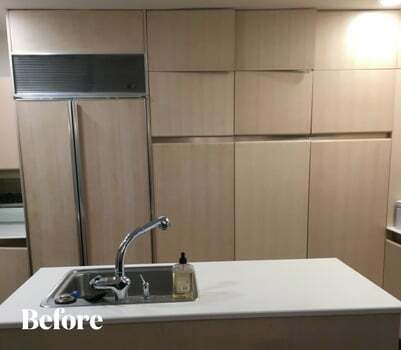 Refaced cabinets with Portobello stain on Maple, plus an island with Driftwood stain for a stylish gray contrast. 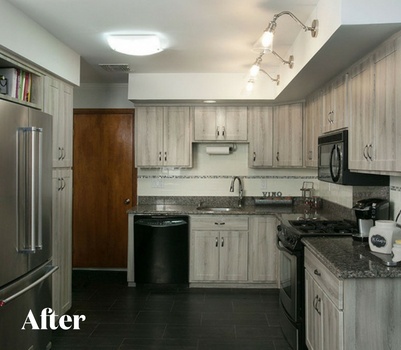 Granite countertops in Blanco Tulum mimic the colors of the stacked-glass backsplash. 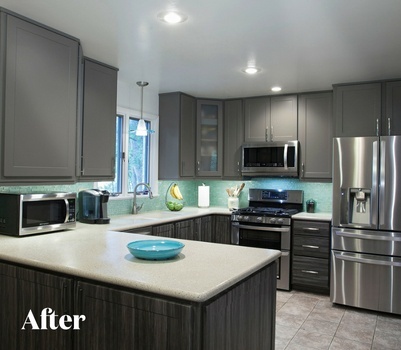 Refacing gives this kitchen a new personality in Suede Gray, coupled with our Statesman door. 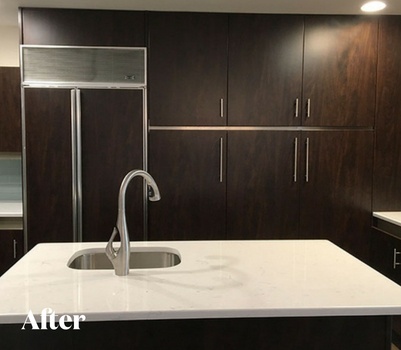 Cambria quartz countertops in Waverton enhance the overall look for a simple, yet rich new design. 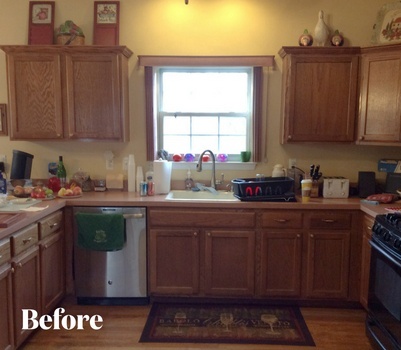 This kitchen is transformed with cabinet refacing. 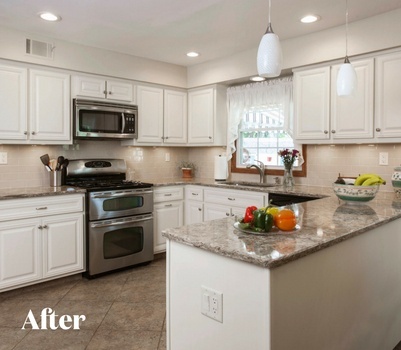 The Satin White Statesman cabinets reflects a New England flavor. 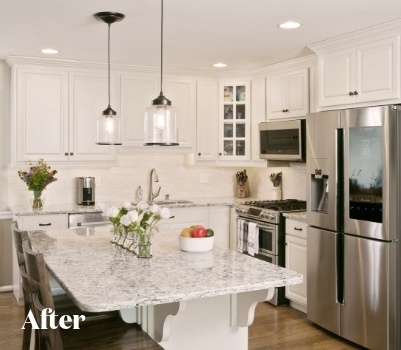 Cambria's Breamar quartz elevate the design to "HGTV worthy". 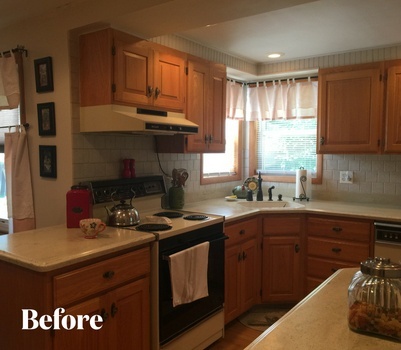 Classic Cherry Vintage Raised Panel cabinets combine with Crema Brazil granite countertops and ceramic tile backsplash for a homey but sophisticated kitchen design. Black and white—a hallmark of a contemporary design. 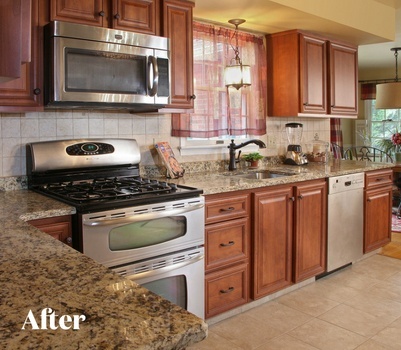 The Vintage style door offers a traditional vibe, making this kitchen a Transitional beauty. Cambria quartz Brittanicca tops off the design. 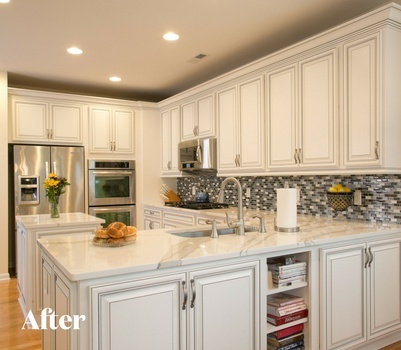 A sophisticated, yet simple palette of whites on Breckenridge cabinets. A walnut cabinet glaze warms the color palette. 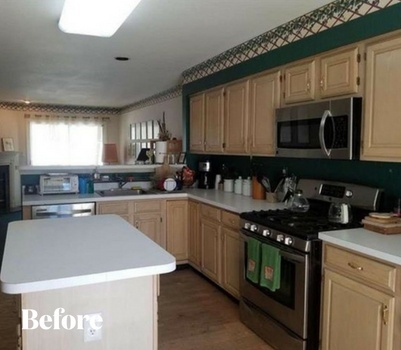 Windermere Cambria quartz complete the transformation. 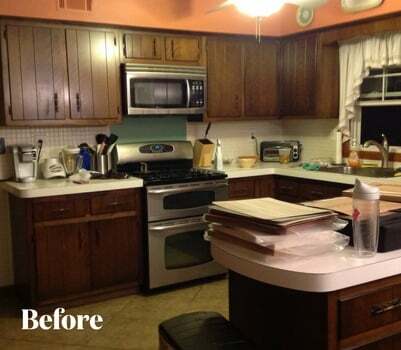 Cabinet refacing transformed this kitchen with the warmth of our Chocolate Pear finish. 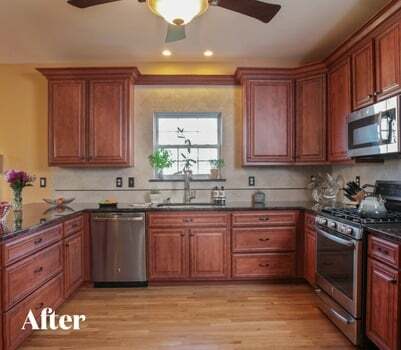 It's the ideal color for our classic Prestige Raised Panel Door traditional style cabinets. 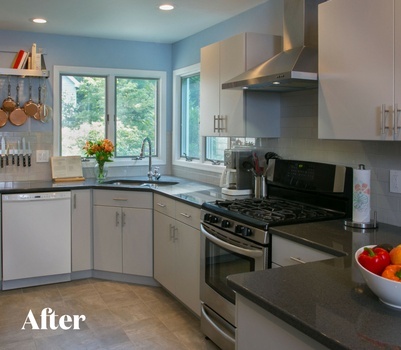 A modern delight, this kitchen was refaced with our Prestige Plain door in Fashion Gray. 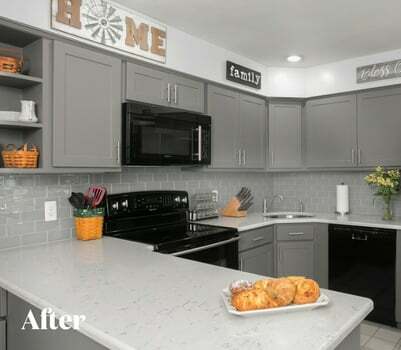 Zodiaq quartz countertops in Storm Gray plus tile backsplash and flooring complete the design. 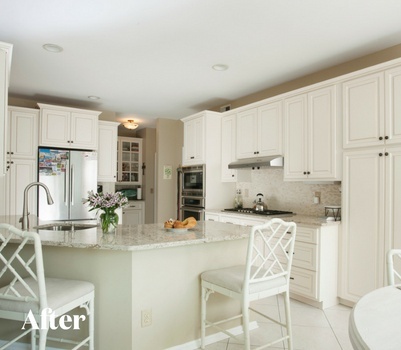 Frosty white cabinets in Madison style enrich & brighten this transitional design. 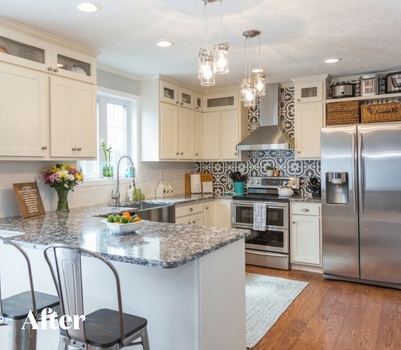 Quartz countertops and a ceramic tile backsplash give this kitchen a luxurious new look. 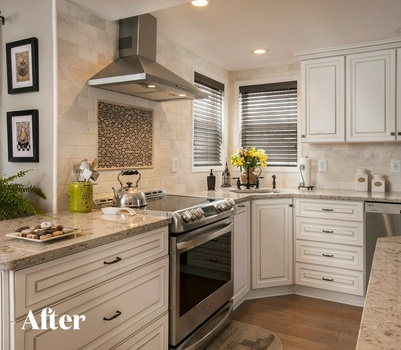 Prestige style cabinetry in warming Hazelnut pairs perfectly with the creamy quartz countertops in Brecon Brown. 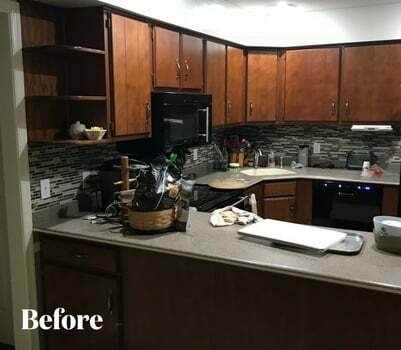 Matching back splash and floor tile in Marrone Chiaro create perfect harmony. 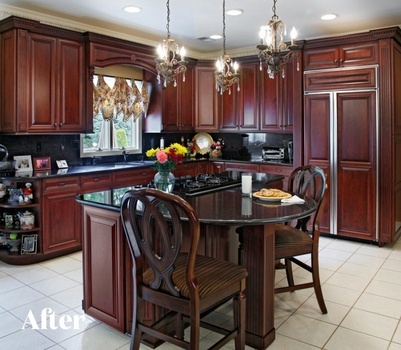 Cabinet refacing creates a traditional masterpiece in this kitchen design. 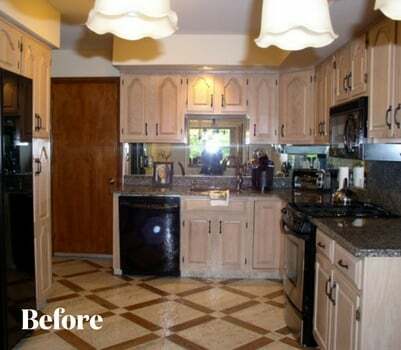 Complete with Vintage style doors in Antique white take this kitchen from outdated to outstanding. 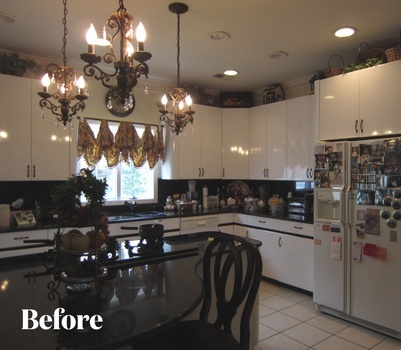 These white raised panel cabinets offer transitional appeal. 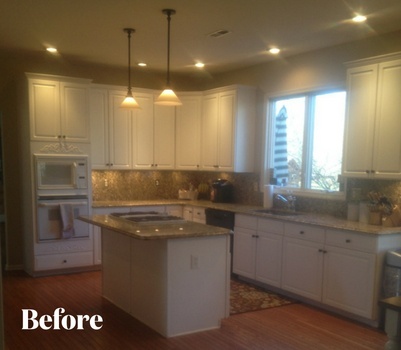 Cambria quartz countertops in Bradshaw and a white subway tile backsplash ground the design with stylish simplicity. 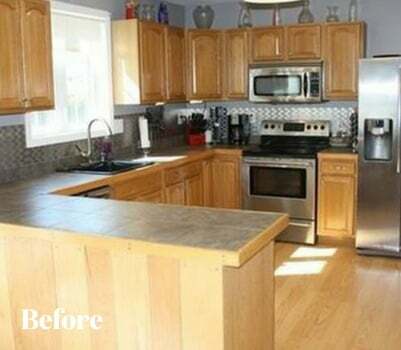 Cabinet refacing took this kitchen from ho-hum to a shabby chic showplace. Barnwood in Statesman style gives this kitchen its rustic charms, providing a homey Farmhouse style. 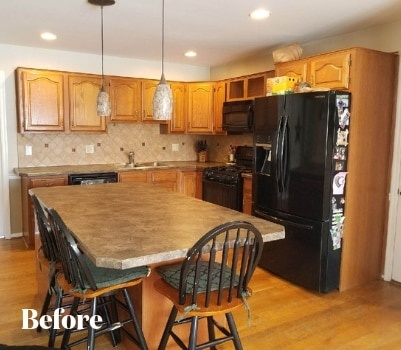 This kitchen now boasts Vintage style, exuding a rustic yet lavish motif. 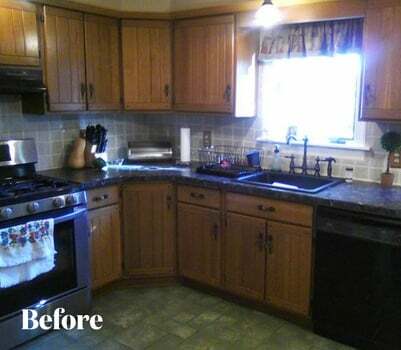 Cabinet refacing replaced the outdated oak with a Classic Cherry graced with a black glaze for depth. 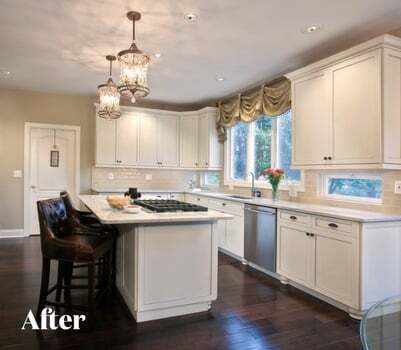 A transitional beauty, this classic mix of traditional and contemporary styles is clean and simple. Decked out in winter white paired with Breckenridge style for an upscale design. 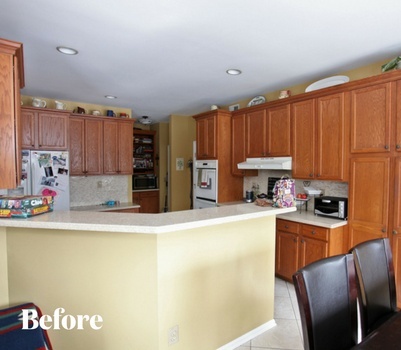 This contemporary kitchen combines complimentary colors. 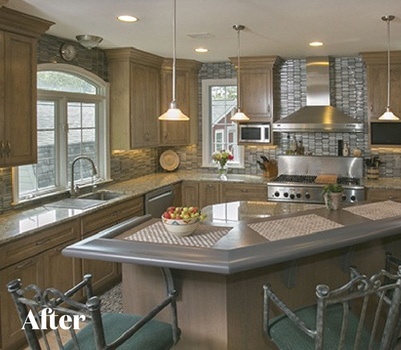 Statesman style in Suede Gray and Merapi with Corian countertops and a glass backsplash complete the design. 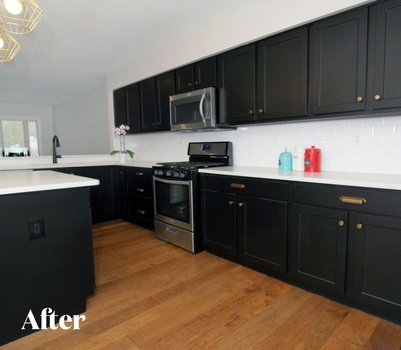 Cabinet refacing in Satin Black on our Statesmen shaker door, balanced by white quartz countertops. 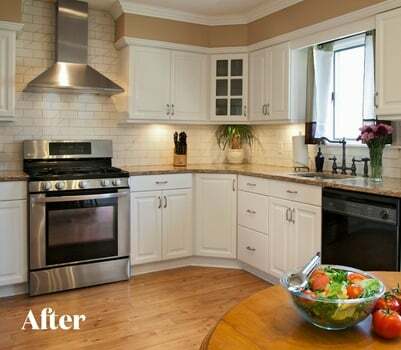 White subway tile backsplash and satin brass hardware finish the contemporary look. 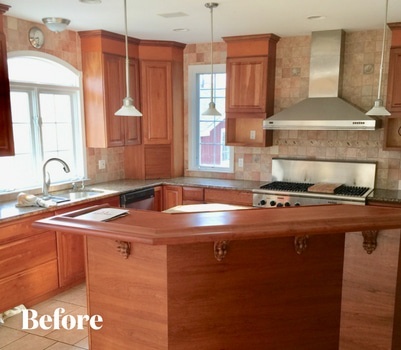 This refaced kitchen features Cordovan on Cherry with a Sable Glaze. 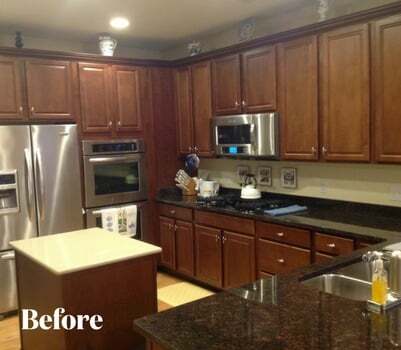 This classically rich cabinet color is highlighted with a custom Classic Raised Panel and granite countertops. 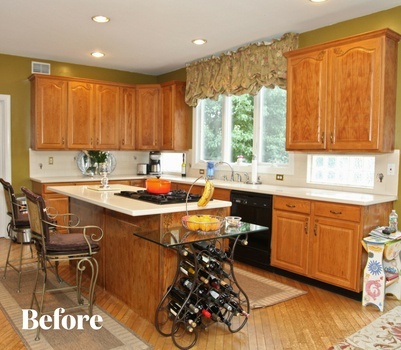 Cabinet refacing transforms a disheveled kitchen into a modern and chic abode. 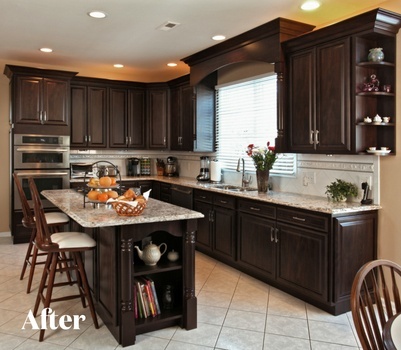 Our Prestige Plain cabinets are dressed up in Chocolate Pear for a Contemporary vibe. 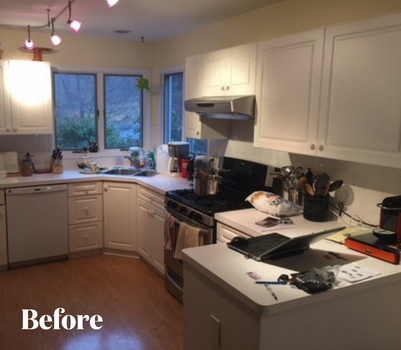 All images shown here show are actual Kitchen Magic projects and work. 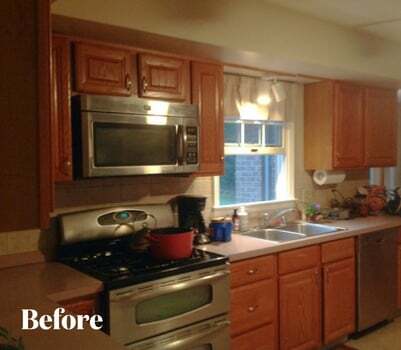 Images are used and copyrighted with customer authorization for exclusive use by Kitchen Magic.